The P220 has been around since the 1970s, and was always chambered in .45ACP until this year, when a fully-redesigned version for 10mm was released. 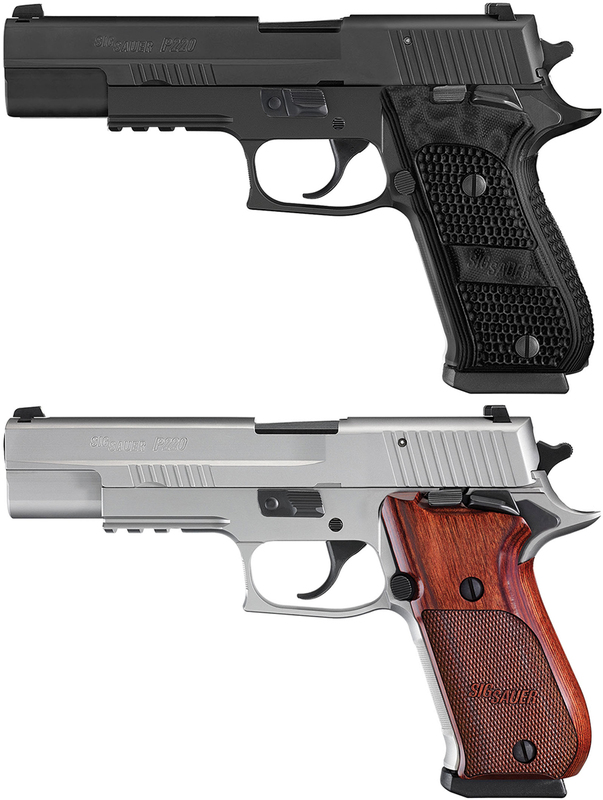 There are four variants of this new weapon, all differences in finish, save a special version of the stainless Elite that has a single-action only trigger; otherwise, they are operationally the same as a normal P220 — DA/SA triggers, a light rail on the front, the decocker, slide release, and takedown lever all on the left side of the gun. This P220 is heavy at 44oz. unloaded, but the weight keeps the recoil of the most powerful 10mm ammunition on par with .45+P. Although not recently, the Sig has also released the P220 in both 9mm and 38 super, and a conversion. Kit from Sig for 22lr conversion is available. That said, the P220 in 10mm is a welcome addition, particularly the da/sa versions. For some time lovers of the 10mm have been limited to 1911 sa or tupperware. Not that there is anything wrong with tupperware. Per se. 10mm is The Boom of Doom. Boom of Doom…I like that.